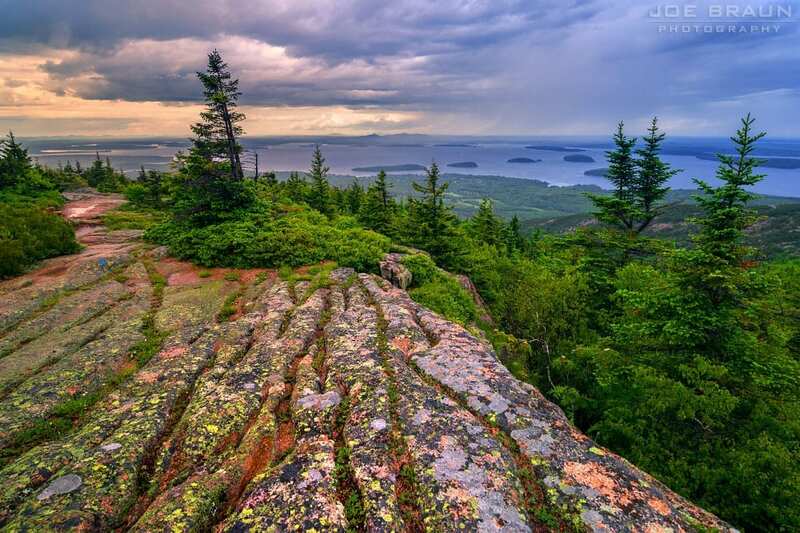 Situated along the northern coast of Maine, much of Acadia National park sits perched atop Mount Desert Island where panoramic views frame the first sight of sunrise in the US. If you’re fortunate enough to spend some time in Acadia National Park, don’t miss the opportunity to see some of the park while on a bicycle. Within the 47,000 acre park, you’ll find a variety of gravel, paved and dirt trails that make up one of the nation’s most historic and aesthetically impressive network of bike trails. Acadia National Park, like most national parks in the US, is uniquely endowed with a surplus of geographic bounty. There’s no better way to see the park up close while hiking, kayaking or biking. With 2.5 million park visitors a year–mostly in July and August–it makes sense to limit how much time you spend in a car since you’ll ultimately be waiting in traffic. If you’re able to bring your bicycle(s) to the park, you’ll find it’s easy enough to locate a trail and to piece together an itinerary. If you want to avoid driving, try the park’s electric Island Explorer shuttle buses to transport you to your destination. Watch the video below to see some helpful clips of the Island Explorer shuttle bus, several parking lots and some of the more scenic bus stops. 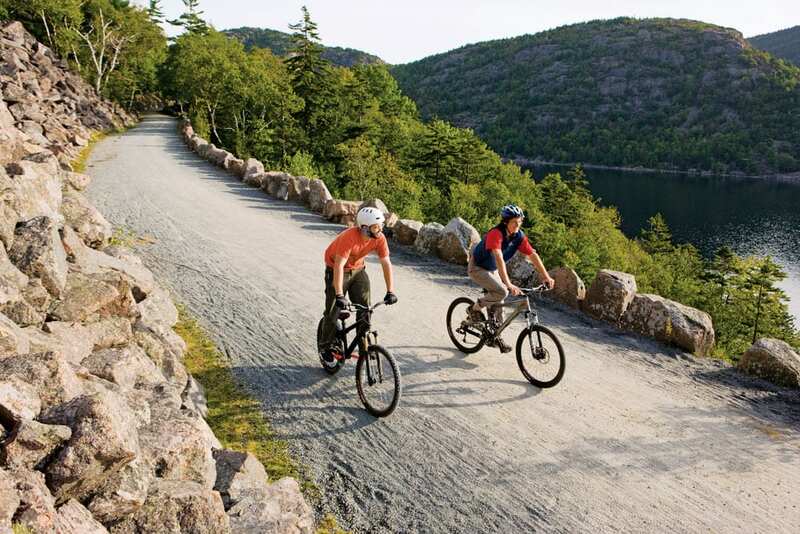 Unlike some bicycling destinations where multi-day tours are made possible by trail-side campsites and trails that stretch out across hundreds of miles, the Acadia National Park bike trails can be characterized as a master trail—the Carriage Trail—ringed by many lesser trails. However, the “lesser” trails that one finds in Acadia are in some cases longer, more functional and more accessible than the popular Carriage Trail loops. In all fairness, the Carriage Trail was never meant to be a bicycle trail or the center point of a surrounding national park. Instead, this engineering marvel was initially designed to showcase the splendor of the area’s natural beauty while traversing hillsides on horse-drawn carriages. While the Carriage Trail wasn’t originally designed for bicycle traffic, it’s one of our nation’s premier destinations for bicycle day tripping. As you discover the friendly flow of the trail’s gentle incline, you’ll also be impressed with the mason work, design and overall durability of the trail. To help contend with Maine’s wet weather the carriage roads were engineered with structural characteristics you won’t often see on a bike trail: stone culverts, wide ditches, three layers of rock, extremely gentle inclines, extravagant stone bridges, and six- to eight-inch crowns for drainage. Make sure you stop along the way to admire the craftsmanship. Case in point: To enhance the aesthetic quality of the trail, retaining walls were often used to preserve the flowing line of hillsides and save trees rather than flattening hillsides. Instead of avoiding a waterfall or noteworthy characteristic of the landscape or surrounding terrain, the Carriage Trail embraces these challenges as opportunities –even when such decisions required more cost, additional trail length and engineering complexity. Not surprisingly, to help connect various parts of the Carriage Trail loops, 16 unique bridges were constructed to further elevate the visual extravaganza that is a trip to the Carriage Trail loops. A list of “Rockefeller’s 16” bridges–and some phenomenal photos of Acadia National Park–can be found on Joe Braun’s website. 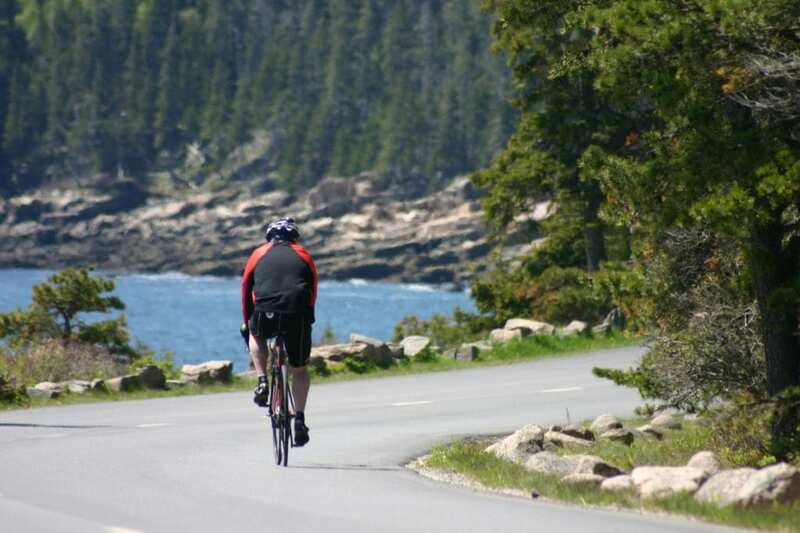 Even though the total distance of the carriage road loops is only 51 miles, you’ll find some other options like the Park Loop Road and the Summit Road to fill your time if you’re hoping to bike for more than a few days while in Acadia National Park. Thankfully, there are many different trails for beginners, groups, families, casual day trippers and mountain bikers. Before hitting the road, spend some time evaluating your itinerary with an eye towards the topography. You won’t be climbing West Coast mountain ranges since the highest elevation you will encounter is only 1,000 feet, but there are definitely some worthy hills to be climbed. In terms of trip essentials, you’ll definitely want to bring a map and a water bottle since there aren’t many sources of water on most of the trails. A Mount Desert Island pocket map is also a handy resource. You can find bathrooms at one of the six Acadia National Park visitor centers or at the campsites. The NPS website includes additional maps for the carriage trails and the rest of the park. For those who want to start easy and have limited time, the Eagle Lake Loop trail is a great option. There are two hills to climb on this loop and a 500-foot elevation change. Go counter clockwise around Eagle Lake for the fast rise uphill, and slower downhill. We tried this direction and didn’t regret it. You can take the Island Explorer shuttle to take you to the small parking lot at Eagle Lake; feel free to bring your bike with you on the shuttle bus. While you’ll find the Carriage Trails exceedingly bike friendly, don’t attempt to bike the paved road from Bar Harbor to Eagle Lake. With the summer tourists and heavy traffic, you’ll be putting yourself in a dangerous position. For intermediate bikers, you might want to try the Parkman Mountain trail. The parking lot for the Parkman Mountain trail is located on the road to Northeast Harbor. Unlike the Eagle Lake trail, we recommend biking clockwise for the best experience. For experienced bicyclists, the entire Carriage trail system can be completed in a single day. Along the way, you may want to stop for a food and restroom break mid-island at the Jordan Pond House Restaurant or pull over at one of the many vistas for a picnic lunch. Keep in mind during the summer, it’s not recommended to catch the shuttle bus from the Jordan Pond bus stop since there’s typically limited space for bikes at that stop. 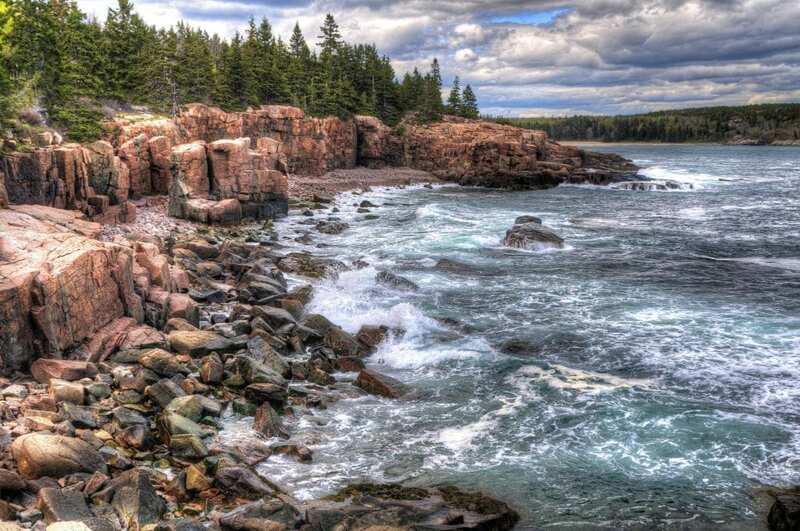 You can find more information about safety at Acadia National park on this site. The 27 mile long Park Loop Road is the primary road connecting Park locations with the surrounding villages of Mount Desert Island. A large section of this road, beginning near the Route 233 entrance point to Cadillac Mountain in Bar Harbor, is one-way. This goes all the way along the east coast of Acadia National Park where it connects the Precipice, Sand Beach, Thunder Hole, Gorham Mountain, Otter Cliff, etc., and ends on the southeastern side next to Wildwood Stables. The remainder of the road system is two-way. From various points on Mount Desert Island, you may access the Carriage Road System where you may begin your exploration of Acadia National Park from the inside. This unique system of roads with crushed rock surfaces, is the main artery that has given the landscape a special vibrancy and connected feeling that is at the heart of the experience. From Bar Harbor, to Northeast Harbor, from Hulls Cove to Wildwood Stables, there are access points. You may also go along the regular roads where vehicle traffic is present, but be sure to take advantage of the Carriage Road System. As originally planned when the Carriage Road system was first constructed, roadways are shared by cyclists, horses, and pedestrians. Caution is advised and one should be familiar with courtesy rules of the road. Biking is not permitted on the park’s hiking trails. One of the most challenging, and one that is only recommended for the strong, healthy, and most experienced cyclist, is the Summit Road to the top of Cadillac Mountain. I am always amazed and impressed to see the dedicated cyclists on their way to the top. The utmost caution should be used as this is a winding roadway shared by many motor vehicles. I would strongly suggest checking with the National Park Service on the advisability of this trek before undertaking it. This 4 mile road winds with a continuous moderate grade for 3.5 miles from it’s base to the top of Cadillac Mountain, the highest point in Acadia. Known as “the other side” of Mount Desert Island, the Southwest Harbor area has scenic fishing communities and long stretches of quiet cycling roads. Schoodic Peninsula is an hours drive from the Visitor Center on Mount Desert Island, also connected by a ferry service from Bar Harbor to Winter Harbor. Eagle Lake: This is one of the most popular starting points. The parking area, located east of Bar Harbor on the north side of Rt. 233 often overflows during peak season in July and August. Start your ride early, if possible. Eagle Lake, at 425 acres, is the largest fresh water lake in Acadia National Park. From the lot, there is easy access to the carriage roads that lead toward half Moon Pond, the Breakneck Ponds and Witch Hole Pond. You can also ride the carriage roads around Eagle Lake for a challenging 6.1 mile loop ride that includes a few steep ascents and descents. Expect some rough patches. There are incredible views overlooking the lake. Paradise Hill: Enter at the northwest end of the Hills Cove Visitor Center parking lot. The 0.5 mile trail that connects to the Paradise Hill carriage road is narrow, step and surfaced with loose gravel. Slippery. Consider walking your bike up and down. Upper Haddock Pond: The parking area is located just north of the Brown Mountain Gatehouse on the eastern side of Rt. 198. Lower Haddock Pond: The parking area is located on the eastern side of Rt. 198 south of Upper Haddock. We like to park here as we usually find it quiet and uncrowded. It provides access to most of the major carriage trails, however the access requires some long climbs. Parkman Mountain: Parking is 2.3 miles south from the intersection of Rt. 198 and Rt. 233 on the eastern side of 198. Bubble Pond: Parking is on the Park Loop Road. The carriage trail that travels along the west side of Bubble Pond is easily accessed from the parking area. Nestled between North and South Bubble mountains, just northeast of Jordan Pond is an easy ride with lots of places to stop and admire the views of the “bubble like” mountains. You will have a choice of bringing your own bike (recommended) or renting a mountain bike at one of three island bicycle shops. There is a bike shop in Southwest Harbor and two shops in Bar Harbor itself. Bicycle rental range between $22- $30 per day. All types and sizes are available. You can even rent bike racks and other accessories. Here is a link to all the shops. 48 Cottage Street, Bar Harbor Maine. One block from the Island Explorer Bus Shuttle at the Village Green. Also rents kayaks. At the far end of Cottage Street, closest to the bridge entrance to the carriage trails. Open all year, they have a variety of types of bikes to rent. Located on the west side of the Island. Open all year. Groups with small children are encouraged to consider renting either trail-a-bike or a tag-along. Both are attached to the back of a bicycle for those ages 4-7 or rent an actual bike trailer that attaches behind a bike for kids from 1 year to 4 or 5. Customize your solution for your particular child.